Kodanda Ramalayam in Tirupati is a wonderful place, clam and serene environment. 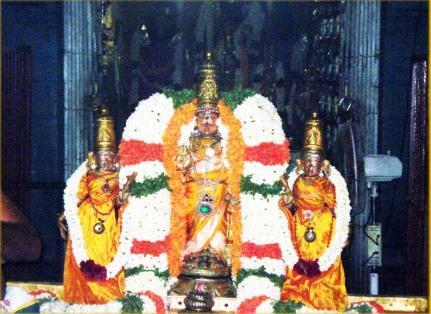 Sri Kodanda Ramalayam is the temple dedicated to lord Rama. The presiding deities of the temple are lord Rama, Sita and Lakshmana. Lord Anjaneya Swamy is seen near the foot of Lord Rama. The temple is in the heart of the city. There is also another temple dedicated to lord Anjaneya Swamy opposite to Kodhanda Rama Swamy temple. The road outside the temple leads to Alipiri. Once upon a time Jambavantha saw a cave in this place and observed some light glowing inside the cave. He asked lord Rama about the light and Rama said its shows the presence of god. Later Jambavantha installed an idol of lord Rama in the cave. It was not noticed till Sri Krishnadevaraya's time. Sri Krishnadevaraya constructed a beautiful temple for lord Rama.